Named in honor of a dearly departed friend who was instrumental in both Dave and Clay's brewing careers, Johan the Barleywine was the first beer ever brewed at Sun King Brewing Co. in July of 2009. The beer was cellared immediately; half of it was released on tap for the brewery's first anniversary in July 2010 and half of it is being released in cans for the brewery's second anniversary on July 1, 2011. Sun King Brewing Co. pioneered the customizable can in early 2011 and Johan is the first barleywine ever to be released in cans. This particular recipe will never be made again. Barleywine is a strong style ale. At 10% ABV and 60 IBUs, Johan delivers a huge malt punch balanced with Pacific Northwest hops. This portion of the one-off batch has been cellared for two years; the flavors are integrated and the subtler aspects of the beer come through in ways they didn't on the day it left the fermenter. The nose on Sun King's batch #1 beer blossoms into a pleasant fruitiness that contains hints of caramel. The flavor that follows the nose is mellow but sweet, melding burnt sugar and a pronounced brandy note. Johan is surprisingly smooth for a barleywine, and given that it's 10% alcohol by volume, it's a sneaky beer. Therefore, you should definitely savor Johan at a leisurely pace. 3.95 Mugs. Sweet, slightly fruity alcohol nose. In true Sun King fashion, this beer is deceptively drinkable. There are really great flavors as this beer warms up, so make sure not to serve it too cold. 3.60 Mugs. Sun King thinks this is probably the first canned barleywine - certainly there's some novelty in that, right? Grape Tootsie-Pop nose, smooth on the front - then the middle grabs the tongue. Sweetness follows and lingers with a little heat that stays with you. Very nice winter beer - warm in the belly. Why not release it in the middle of summer? Maybe they released it in the middle of summer as a hint - let that thing get to room temp. That's where it really opens up. 3.75 Mugs. Ah, Johan. Batch #1. The first and oldest of the Sun King beers. We meet again. 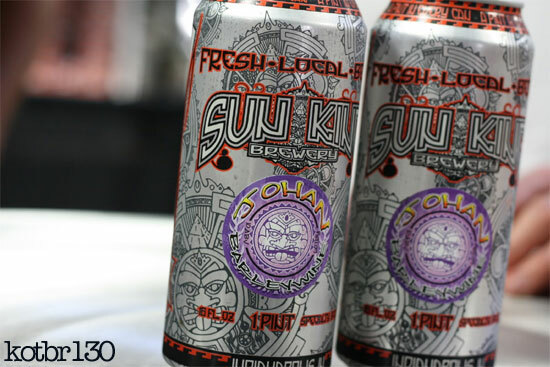 At Sun King's first anniversary party, I was wowed with how well-balanced and deceptively smooth Johan was. With another year of age, I'm a little less impressed, but still happy with the results. This beer opens up with a beautiful array of scotch-like qualities. Aromas of coconut, raisin, toffee, and brown sugar are immediately noticeable. As Johan warms up, creme brulee and a bourbon-like alcohol character settle in. The barleywine was a bit on the cold side when I first tasted it. A quick burst of sweetness quickly subsides into warming alcohol. Raisins and brown sugar follow through from the nose to the overall flavor of the beer, but the overall effect of these with the alcohol creates something more reminiscent of brandy. Overall, Johan seems a little more harsh on the alcohol than it was a year ago. So much that it had a bit of a drying effect on the back of the tongue that created an odd flavor I couldn't quite pinpoint. After about 10 minutes I revisited the last of my sample and found that the warmer temperature brought out a more rounded sweetness that made it fit my personal expectations of a barleywine a bit better. When I purchase my reserved allotment, I will certainly be consuming it warm. 3.5 Mugs. Earthy notes, much like raw mushrooms on the tongue's tip, leaves a dry mouthfeel. There is a sweetness, though there is not a lot there. But yes, it is there. It finishes warm. It's not hot; it's rather sly. Johan is easy. 3.90 Mugs. Cans of Johan the Barlewine will be sold today through a reservation system (all reservations have been taken) and on a first-come, first-served basis. Want more details on how you can get a can of Johan? Read the directions here.